Home > Pain Relief > Which Drugs or Foods React With Histamine Blockers? Histamine blockers are used by sufferers of stomach complaints. They are used to relieve pain and can also prevent the problem from returning. They are commonly used and pose little risk to the patient however they can react with other medications and foods.Histamine blockers are often used to treat peptic ulcers. Peptic ulcers are ulcers that affect the gastrointestinal area i.e. the stomach. They can be extremely painful and cause much discomfort for sufferers. 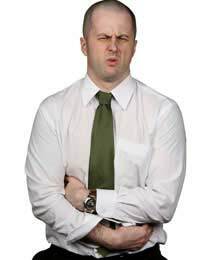 Some peptic ulcers are caused by malignant tumours but often they develop on their own. Doctors prescribe Histamine blockers to patients in order to lessen the pain the ulcers cause.Histamines increase acid secretion which results in ulcers to the lining of the stomach. Histamine blockers stop the acid secretion and therefore can prevent ulcers returning in the future. Histamines can also cause headaches, often called pressure headaches, heart palpitations, itching, rashes, breathing difficulties and anxiety. Histamine blockers prevent many of these symptoms and as such are a very common and popular drug. Histamine blockers can be taken with or without food. Some drugs can only be taken on a full stomach but the effects of Histamine blockers are not affected by whether or not the user has eaten beforehand. If you find certain foods are reacting with your medication then it might be worth speaking to your doctor. He or she will be able to advise you of what you should do. Users should however avoid having too much caffeine when take histamine blockers. Caffeine can irritate the lining of the stomach which itself can cause discomfort and pain. Avoiding caffeine prevents the lining from becoming irritated and in turn can help prevent ulcers forming. Histamine blockers are not known to interact with many other drugs. But as a result of the fact they reduce the acid in the stomach it is thought that any drugs which rely on acidity in the stomach to work effectively may not work as well when take with histamine blockers. It is suggested therefore that patients who are on these drugs, such as Ketoconazole should be taken several hours before the histamine blockers are taken. Histamines are used by many people and are often prescribed by doctors as a pain reliever but users should be careful when taking them alongside other medications and certain food and drink. If you ever have any doubts when taking medications about what foods you should or should not consume then you should speak to your doctor. He or she will be able to advise you on what you can and cannot eat and drink. If you suffer any reactions to any medication you are taking you should speak to a doctor immediately. Just because an interaction is not known does not mean it does not exist. Everyone is different and some reactions may occur in some people but not in others. Always speak to a doctor when you have any concerns and if you feel your doctor is not taking your concerns seriously it may be worth seeking a second opinion.